We are located in Laulasmaa, 35 kilometres from Tallinn, on a beautiful natural peninsula between the sea and a pine forest. The simplest way to get here is by car, but you can also come by bus, by bicycle, or on foot. The Centre’s parking lot is equipped with a bicycle parking rack. Head towards Laulasmaa. Once you have reached the village, turn towards Lohusalu. After approximately 700 metres, you will see a signpost for the Centre. Turn right onto Kellasalu Road. Our parking lot is located at the beginning of the road, and you are kindly asked to park your car. From there, a marked forest path will lead you to the Centre; the walk takes about ten minutes. 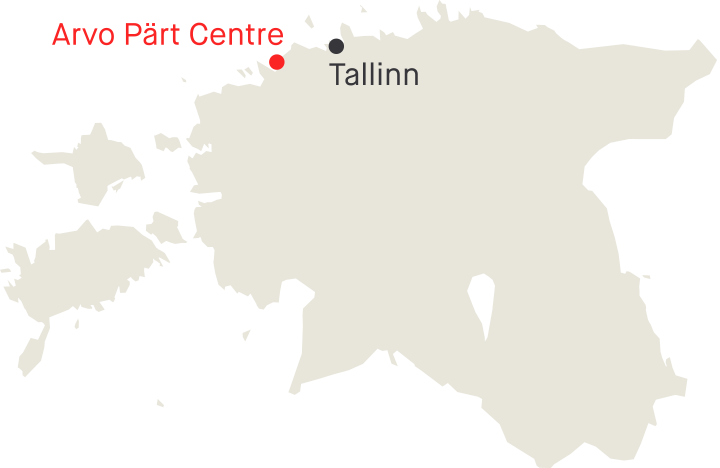 The Arvo Pärt Centre is located approximately 250 metres from the parking lot. 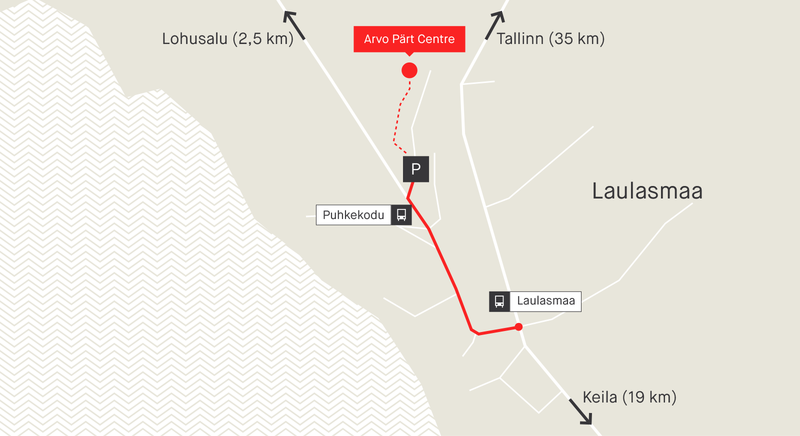 You can get to Laulasmaa from Tallinn by buses 126, 127 and 128 as well as commercial bus 237. Puhkekodu bus stop is located near Kellasalu Road. At the start of the road, there is a parking lot. A marked forest path starts on the forest side of the parking lot, leading 350 metres to the Centre. Laulasmaa bus stop is located approximately 900 metres from the Centre. At the bus stop, turn onto the road leading to Lohusalu. Kellasalu Road is approximately 700 metres from the Lohusalu crossroad. A marked forest path starts on the forest side of the parking lot, leading 250 metres to the Centre.